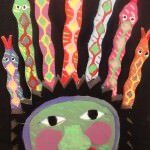 Elissa Farrow Savos, a sculptor who lives in Sterling, Virginia, has been exhibiting at Gallery C since 2014. 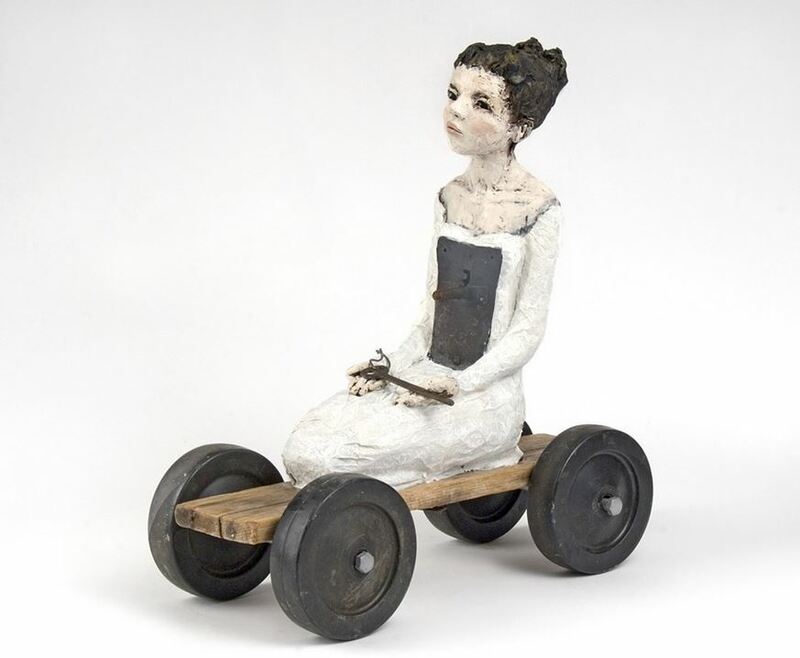 Her figurative sculptures are made with polymer clay bodies mounted to found objects. 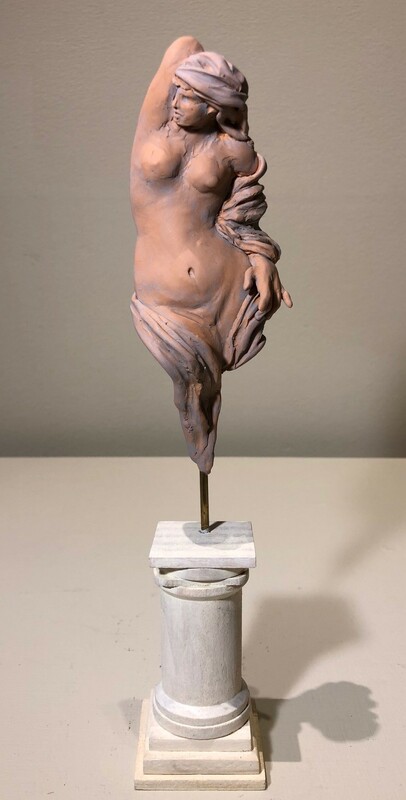 The low-fired polymer clay is then painted with layers of oil paint. “Every piece I make is about storytelling, each a narrative of some woman somewhere, and every woman everywhere. My head is full of the reasons and meanings behind each piece – usually a convoluted combination of a very specific experience with a myriad of emotions and thoughts and opinions that could be many, many words, but instead is this one piece, or maybe two. Elissa has been an artist since, well, forever. Growing up in New York City in a family of artists, it was simply what you did, and no one questioned its validity or its practicality. 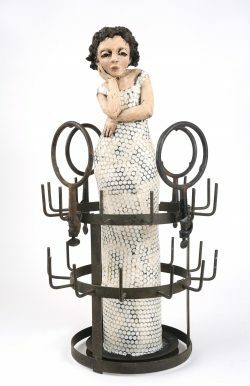 She went to special schools throughout her youth to develop her abilities, and the rest was not too unusual – off to Connecticut College, (majoring in Painting and Computer Graphics, minoring in Women’s Studies, Religion, and Education), a lengthy break to marry, have three children, and then back to creating art. 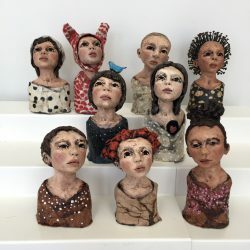 Since then, Elissa has been sculpting with a unique and somewhat uncommon material – polymer clay. 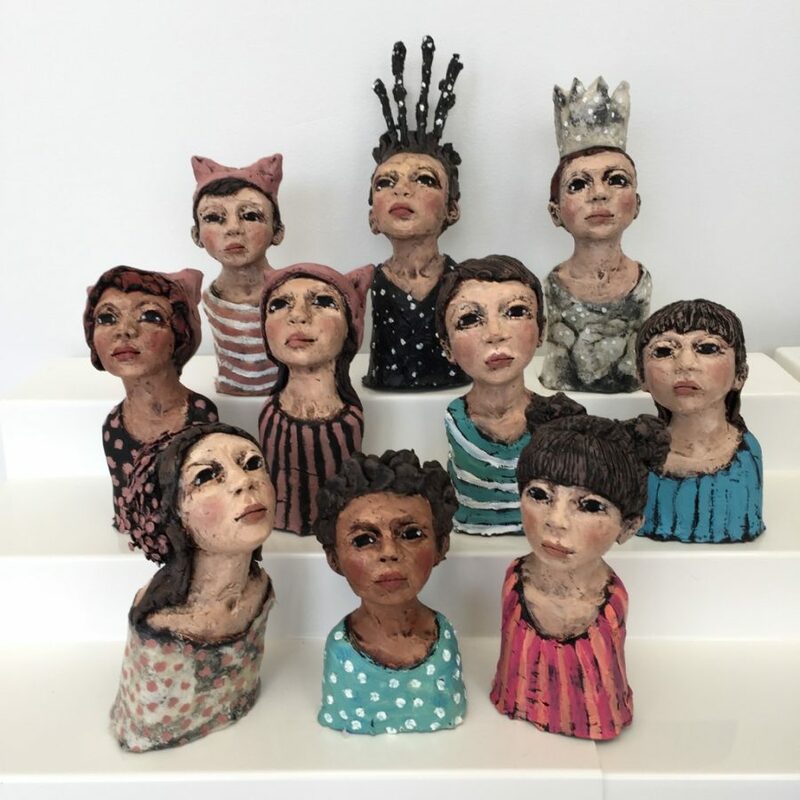 Pushing the clay past it’s intended boundaries and finishing it with oil paint and found objects, Elissa has forced the medium to do her bidding – create a world of women and their stories. 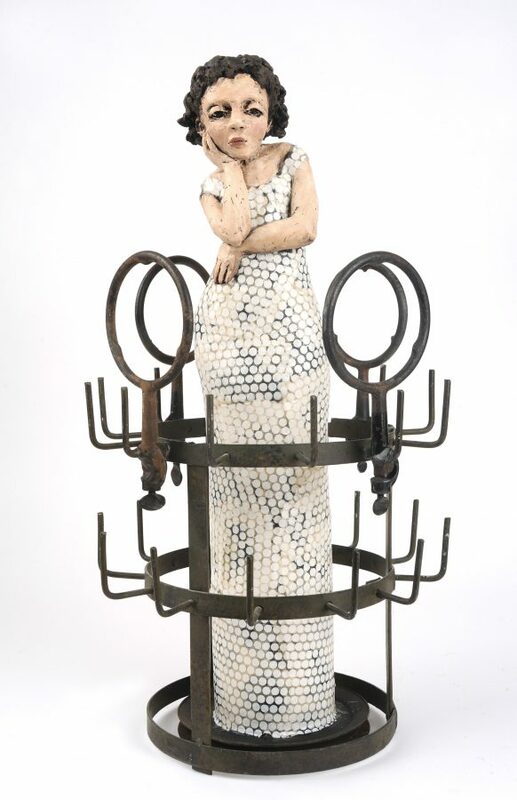 She has exhibited her sculptures all over the country, and most recently in solo and group exhibitions in D.C., Virginia, and Maryland. Elissa Farrow-Savos’s “Be Bold and Mighty Forces Will Come to Your Aid”. Collaging art and nature images atop world maps, Scarborough crafts vast geographies that merge the actual and the fanciful. 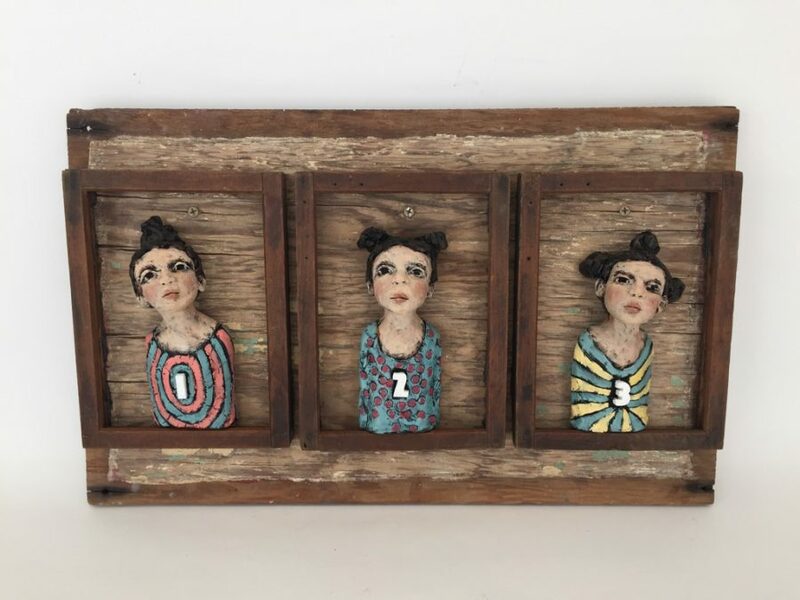 Farrow-Savos makes painted polymer-clay sculptures of single or occasionally twinned figures, but gives these individuals a broader context by incorporating found objects and covering surfaces with repeated patterns. The statues, which always portray women, are often mounted on wheels or other forms of locomotion. The clay women appear ready to traverse Scarborough’s imaginary terrain of flowers, animals and reproductions of celebrated works from art history. Scarborough’s symbolic landscapes, their pieces artfully fused with painting and glazes, bloom with variety. As populated as a large Bruegel canvas, the collages lead the eye from one incident to the next, without any central focal point. The motifs that Farrow-Savos paints on her sculptures are usually simpler, although one of the women is wrapped in a shroud covered in old photographs. The piece’s title warns against “the absence of memory,” which seems an odd concern in a show packed with presence. 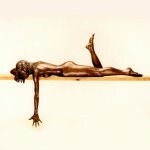 Both artists make fantastic whimsies that require careful observation of the real world.